Megabuyte, June 2012. Original article here (£). Silicon Valley sounds like it should be an airborne construction of glass and steel, with flying cars whizzing around as entrepreneurs test out their latest inventions. But instead, this capital of innovation is string of small suburban towns: San Jose, Santa Clara, Sunnyvale, Mountain View and Palo Alto, all nestled in the crook of the San Francisco peninsula. So what is it about Silicon Valley that makes it the world’s most dynamic place to be a technology startup company? 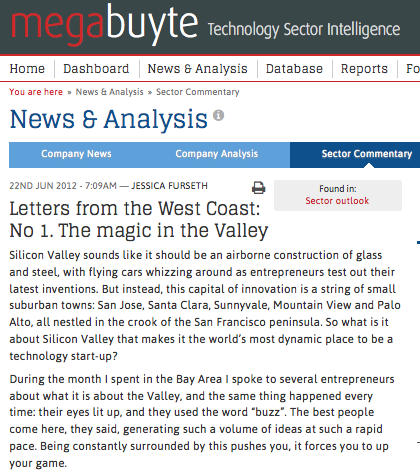 During the month I spent in the Bay Area I spoke to several entrepreneurs about what it is about the Valley, and the same thing happened every time: their eyes lit up, and they used the word “buzz”. The best people come here, they said, generating such a volume of ideas at such a rapid pace. Being constantly surrounded by this pushes you, it forces you to up your game. Mountain View, home to Google and neighbour to Facebook, is just an hour south of San Francisco, courtesy of Caltrain. Walking down the street of this little town that intellectual property built I was surprised to find the innovator spirit is actually present in a very physical sense. On Castro Street, the main thoroughfare, you can hear people in Mozilla Firefox shirts talking shop, while the next killer app is being drafted on a napkin upstairs at Red Rock Cafe. It was here it all started, in 1956, when William Shockley left Bell Labs over his conviction that it was silicon, not germanium, that was the future of the transistor. Shockley Semiconductor Laboratory now has a plaque to mark this fact, but the real legacy is probably that of having nurtured employee Gordon Moore to go found Intel in 1968. Entrepreneurs keen on more urban settings in downtown San Francisco are mostly found in SoMa, an up-and-coming innercity area far from the chipper bells of the city’s ubiquitous cable cars. VigLink’s business is weblink monetisation, and founder and CEO Oliver Roup moved to San Francisco especially to set up the company in 2009, after leaving Microsoft. Other cities could probably replicate many of Silicon Valley’s key characteristics to attract a startup community, but it would be hard to supercede the Valley’s size and history. The sheer tolerance for risk is a particular element that feels very alien from a UK perspective. Suranga Chandratillake, the San Francisco-based CEO of London-listed Blinkx, explained during our chat how the UK venture capital scene has many players from a finance or big company background, but you cannot use those criteria to assess a startup because they work completely differently. “With a startup it is more about products, the market, and about what products will work for a market. It is about what kind of personalities you need to build a team,” said Chandratillake, who founded video search software specialist Blinkx in 2004 and spun it out from Autonomy in 2007. It is understandably hard for a venture capitalist to back an entrepreneur with nothing but a PowerPoint presentation and a big idea if he or she has no idea what that is like; this is an extreme example, but the West Coast is probably one of the very few places where that can happen. Part of the reason for this, said Chandratillake, is because the Valley now has an investor community that is established enough for former tech entrepreneurs to have gone full circle, meaning many are now part of the funding teams themselves. The fact that this hyper-optimism also allows for people to make mistakes is probably one of the key differences that makes Silicon Valley such a powerhouse. This attitude is instrumental to creating a nurturing space for feisty tech geeks to try out new ideas: you cannot make an omelette without breaking a few eggs. Of course, no one has forgot what it looks like when it goes wrong: the dot-com bust was only 12 years ago. And now, heat is again building in the sector, as seen with the values attached to the Facebook float and increasingly highly priced M&A activity with billion-dollar price tags for Instagram and Yammer. Looking at the big picture, San Francisco is in many ways the ultimate boom-and-bust town, stretching all the way back to the Gold Rush in 1849. The same attitude that meant the city was rebuilt at a pace of 15 houses per day following the 1909 earthquake, which flattened the city, may be the very same reason the Bay Area has such an impressive track record for coming up with things that literally change our lives. There is of course the hope that the Valley has learned a thing or two from its previous failures, and will avoid busting quite so spectacularly again. Fingers crossed that 56 years of experience will count for something. Posted on 06/22/2012 by Jess. This entry was posted in Business features, Technology features. Bookmark the permalink.